So far Laura Young has created 7 blog entries. All electricity, linen and towels included in the rental. You are welcome to use the Washing Machine should you need to. The Kitchen has a large oven complete with hob, there is extensive kitchen-ware and utensils for all guests in the cupboards and drawers. There is also a Dishwasher, please use this wherever necessary. The Car Park takes up to 4 cars parked neatly in the drive at the rear of the house. I would recommend taking shoes and socks off before going upstairs within the house (the carpets are fairly difficult to maintain during the Winter months). Chichester has a number of charming places to eat and drink ranging from, authentic pubs, restaurants, free houses, gastro-bars, and chains. The House is perfectly equipped for entertaining guests or family. On your way in there is a large entrance hallway with the large dining room to the right. Immediately on your right there is also a large Library (this also has a grand piano for those of you that know how to play). On your left you’ll find one of the TV Rooms. Behind this toward the rear of the house, overlooking the garden, you’ll come across the Kitchen. The Kitchen is fairly small in comparison to the size of the rest of the house but you’ll find its well equipped with everything you should need. Electric oven, dishwasher and large fridge / freezer. There is also a downstairs cloakroom / utility room with washing machine and a second fridge for extra wine storage! The back door leads directly to the garden (down a few steps), leading onto the patio area to the right. The path then leads down to the utility shed and parking area. Wander upstairs and there you’ll also find a second sitting room with large T.V and DVD Player overlooking the garden to your left. Then opening up through double-doors you’ll come across the study complete with desk, chairs, and a pool table. Here you will also find the wifi access (via the router). On the 1st Floor you’ll find a Single Bedroom and Double Bedroom overlooking the front of the house with en-suite shower room. The second Double Bedroom on the 1st Floor overlooks the rear of the house with a lovely view of the garden. Next to this you’ll also find the House Bathroom complete with rolltop bath, wash basin and W.C.
Up on the 2nd Floor there is a large bedroom overlooking the garden with 3 single beds. There are also two Double bedrooms overlooking the front of the house (one of which has an en-suite shower room) and the third room is a large room fitted with a single (4ft 6) bed. The next House bathroom has a bath, separate shower cubicle, wash hand basin and w.c (again this bathroom overlooks the garden). Chichester is home to the internationally-renowned Festival Theatre and now the newly built and relocated Chichester District Museum called The Novium is a stone’s throw from Chichester Cathedral. With an exciting line-up of regularly changing temporary exhibitions, an important permanent collection, and a packed programme of workshops, talks, tours and live performances, we hope you enjoy your visit. The Goodwood estate provides a plethora of entertainment and activities. Most famous for horse racing and motorsport events; the races at Glorious Goodwood for those who enjoy punting, and for motorsport fans Goodwood Revival & the Festival of Speed are two of the most important dates in the calendar. If that’s not enough there is a Health Club, an airport, a golf course and a Hotel all of which are kept in magnificent condition by the Earl of March. The Novium’s events programme features activities for all ages – from storytelling, workshops and creative craft sessions, performing arts groups, guided walks and archival film screenings. The Cass Sculpture Foundation is the place to experience the very best of contemporary sculpture, with 26 acres of West Sussex woodland complete with over 80 fantastic sculptures. You can explore the 50-acre site and even visit some of the 50 exhibited buildings. A great day out for the historians among us. One of the most historic and glorious Cathedral’s in England, Chichester boasts this living and operational building which has been at the centre of life in Chichester for nearly 1000 years. A nice day out providing the weather is good. A cost effective ornithologists dream (best to ring them to organise a boat / booking before hand). One of the nicest draws about the house is the Patio area. The Patio area comes complete with table and chairs, with the BBQ leading to lawn area. It is definitely worth planning at least one BBQ at the house during your stay, you just need the English weather to compliment you somewhat! There is a then a pathway running down the garden which leads to the house car park. The parking area is shared with the flats to the rear of the house. Residents will use the path to get to and from the building but the garden is for sole use of guests staying at 5 East Pallant. There is parking for a maximum of 4 cars. Please note that the entrance to the garden is not gated and therefore children will need supervision. 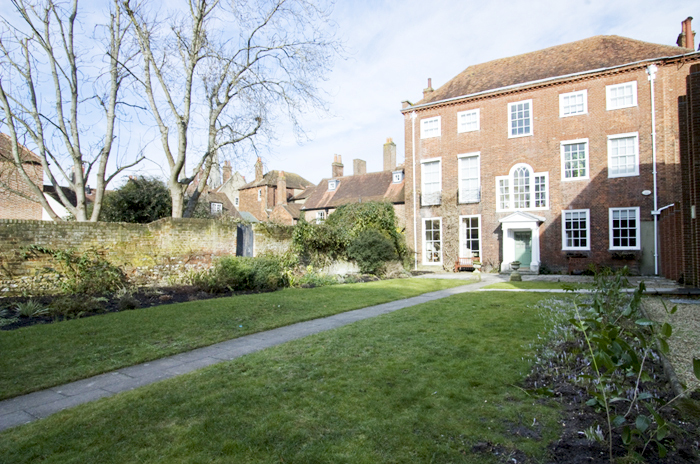 A large self-catered, fully equipped holiday retreat / house in the heart of Chichester, West Sussex.